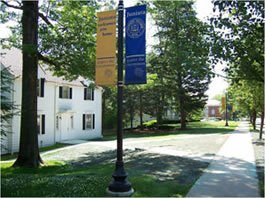 Welcome to the website of the Campus Ministry Office at Juniata College. We invite you to learn more about us and the opportunities available for faith development and enrichment at Juniata. Juniata was founded by the Church of the Brethren, a small Christian denomination which originated in Germany in 1708. This heritage has brought with it a commitment to service, peace and justice which continues to this day. The college has always been open to students of all religions and values the diversity found within our campus community. The Campus Ministry Office offers programs, resources, support, and opportunities for spiritual reflection and growth to students, faculty, and staff. We are committed to interreligious dialogue and the potential for peace that we believe is discovered as we learn from and about one another's religious and spiritual traditions. The Campus Ministry Office is located in the Unity House at 1905 Moore St. The Unity House is shared with the Office of Diversity & Inclusion and provides an inviting social space and an interreligious Meditation Room.